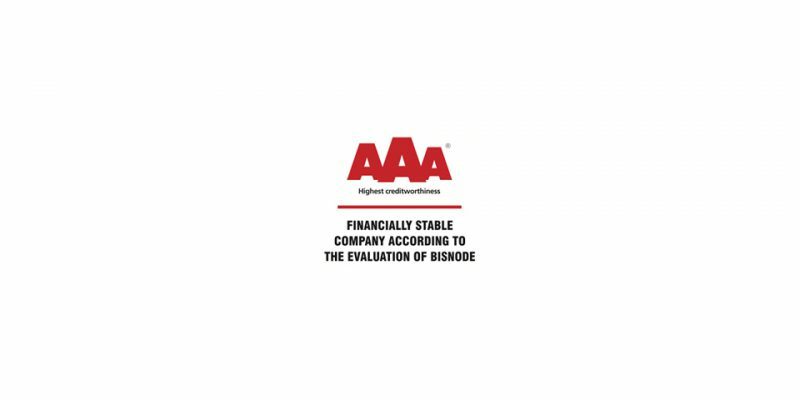 Debra Net LTD. has received Bisnode’s AAA certificate, which belongs to only 0.63 % of the companies in Hungary, and it indicates that the financial risk of establishing business relations with Debra Net is extraordinarily low. The basis of the Bisnode certificate is Bisnode’s rating system, which has been used for rating companies in view of their reliability since 1908. Issued with AAA, AA, and A ratings, Bisnode certificates indicate the stability of companies, and that companies in possession of such ratings – i.e. Bisnode certificates – have steady financial standing. The AAA company rating was introduced in 1989, and firms have had the opportunity to demonstrate their business reliability in the form of certificates as well since 1996. The certificate provides means for the eligible companies to show to others that their companies are recognized, reliable and creditworthy undertakings. The Bisnode certificate is used in several countries across Europe, while in the Nordic countries it is considered to be a standard of trading. The Bisnode rating is based on data originating from multiple official sources, such as information from the Ministry of Justice and Law Enforcement, entries of the Courts of Registry, as well as the data of the National Tax and Customs Administration and other authorities. In addition to the data from the official sources, the financial information regarding the firm, such as balance data, profit and loss accounts, and trends are incorporated, as well. For the rating, the demographic data of the company or organization are taken into consideration, i.e. the company’s age, activities, size and owners, alongside their interrelations. It is incorporated from the Bisnode Payment Experience Program into the rating whether the given enterprise settles its invoices at their due dates or with delays, i.e. what their payment discipline is. Furthermore, numerous other pieces of information gathered contribute to the system of Bisnode’s rating, such as legal enforcement details and press reports. “As the Bisnode certificate does not only show the currently steady financial standing of our company, but partly owing to the design of the Bisnode certificate it also indicates the probability of our business becoming insolvent in the forthcoming year, we can proudly state that Debra Net LTD. shall continue to be a steady actor of the market in the future, too,” says Zoltan Body, Owner and CEO of Debra Net.